Tellus: A sandbox world for Dungeons and Dragons 5th Edition. 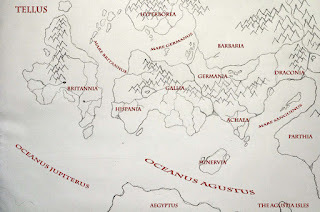 The world of Tellus is connected to our own world through several hidden crossings. It is a world where many of the the gods of Earth originated. A world of fairies and monsters and magic. It is also a desolate death world beset by undead abominations populated by the scattered remnants of broken empires. Humans, as we know them, are not native to Tellus. Millennia ago humans were created on Tellus by the younger gods. They lived a pampered life of plenty. The younger gods doted on their children and the humans of Tellus grew decadent and lazy eventually dying out. The elder gods banished the younger gods to Earth where they were told to try again at creating humanity in a land less fertile and comfortable. Having learned their lesson the younger gods set about to re-create the race of man on Earth. Instead of pampering humanity they allowed their children to suffer or prosper largely by their own devices giving minor gifts only to those who sacrificed and prospered. Civilizations rose and fell and for the most part the younger gods were content to observe from afar guiding these civilizations but never interceding on their behalf in a major way. The younger gods eventually grew bored with their creations and completely negligent of humanity. Realizing that their gods had abandoned them humans began to search for new paths to salvation and enlightenment. New religions sprang up and took hold gaining followers by the thousands and millions. Still the younger gods ignored mankind content to exist in their own demi plains and squabble among themselves. That was until their powers started to diminish and they themselves began to die. Turning their attention back to mankind they soon realized that they could not stop the spread of these new religions so they developed a plan. Despite many centuries of neglect there were still a number of humans devoted to their worship. The younger gods began to move their human worshipers back to their home world. At first in secret but then openly. Seeing that these humans were much stronger and more independent than than the original children of the younger gods the elder gods allowed this migration and even suggested lands where humanity could colonize and prosper. The younger gods altered the memories of the humans making them believe they had lived on Tellus for their entire lives but allowing them to retain something of their own identity. For over a thousand years the younger gods brought their followers from Earth to their homeland until very few of their followers remained on Earth. Humans settles Tellus and some of them became quite prosperous. In particular the humans of the Roman Empire who created an empire of their own. 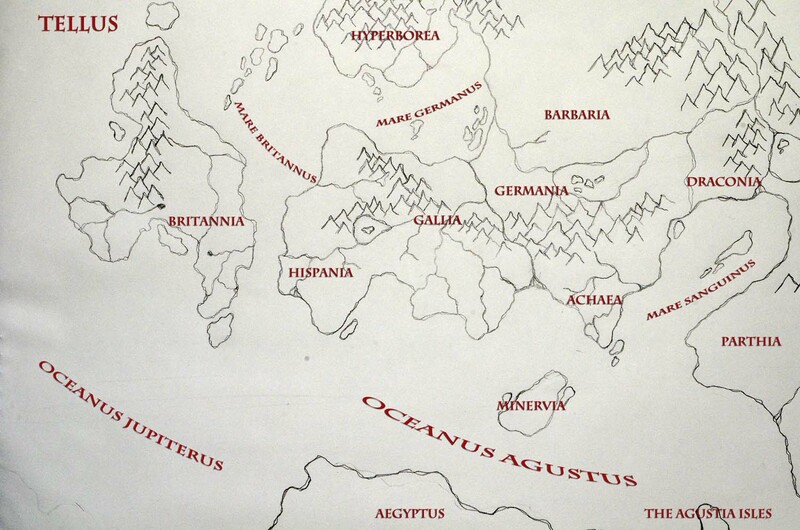 The Agustian Empire grew strong and their gods grew stronger along with them. There was a problem however. The elder gods had their own children who had lived on Tellus far longer than even the original humans. Many of these “elder” races embraced the new humans and helped them prosper even allowing themselves to be absorbed into the human kingdoms and empires. Others however resented the humans. Of all the elder races that clashed with humanity none were as powerful nor malicious as the dark elves. The dark elves hated all the other races of Tellus but they hated humans most of all. Eventually their Witch King decided that he could no longer ignore the human threat. The exact date has been lost to time but approximately two centuries ago the Witch King developed a magical plague that would weaken all the other races of Tellus and allow the Darks Elves to dominate the world. The Witch King gathered powerful members of every race to be sacrificed at a great volcano in the heart of the Dark Elf lands called “The Great Cauldron”. As the Witch King was performing the sacrifices he approached the last sacrifice, a human priestess of Minerva known only as Laelia, he was surprised when she attacked him having broken free of her bonds during the ritual. The two wrestles with their bare hands above the volcano. Their struggle was brief and the they fell into the lava setting off the powerful magical energy of the ritual and causing a chain reaction. The volcano erupted with such magnitude that nothing but a smoldering crater remained. Tens of thousands of dark elves died on the spot and the ash from the eruption blacked out the skies. A great darkness descended on the world as the Witch King’s plague spread. For decades the combination of the Witch King’s plague and the great winter brought on by the volcanic ash devastated the world. Slowly however the lands and races of Tellus began to recover but the world is still plagued by wandering undead caused by the plague. Civilizations are broken and scattered, trying to rebuild and recover lost knowledge. This time has come to be called “The Ghost Age”. Notes: This is a "sandbox" world I am creating for my local gaming group. As we adventure my players will help me flesh out this world. Their actions will have direct impact on it's development. I will be posting game reports here as well as projects I am doing for my games.